System Recovery is the dedicated plug-in for Handy Backup that allows creating a snapshot of an entire operating system, saving it as the VirtualBox (VHD) image. You can open this system recovery disk later for browsing its content, or run it as the fully functional virtual machine drive! This plug-in creates a VHD file, which can be used as the workable image for a VirtualBox virtual machine manager. You can use the operating system recovery file at any time when you need it, and on any computer containing a copy of some VM software such as VirtualBox. The “System Recovery” plug-in creates a precise copy of your system, which can be used for making a bootable drive (for example, with a Handy Backup Disaster Recovery utility) and restoring your system from scratch when the need emerges. Some file-management tools allow opening the VHD files to browse the content for specified files, folders or other data. Therefore, you have no need to recover system totally to find just a couple of files you need. Instead, you can open the system recovery disk as a VHD file and pick data from it. To have full access to system recovery options, create recovery drives and prepare yourself for easy system recovery, you need the Professional edition, or higher. Open Handy Backup, and create a new task by selecting a menu item or by pressing Ctrl+N. Select a backup task on a Step 1, then proceed to Step 2 and select “System Recovery”. A new window will appear, providing a list of physical drives for selection. 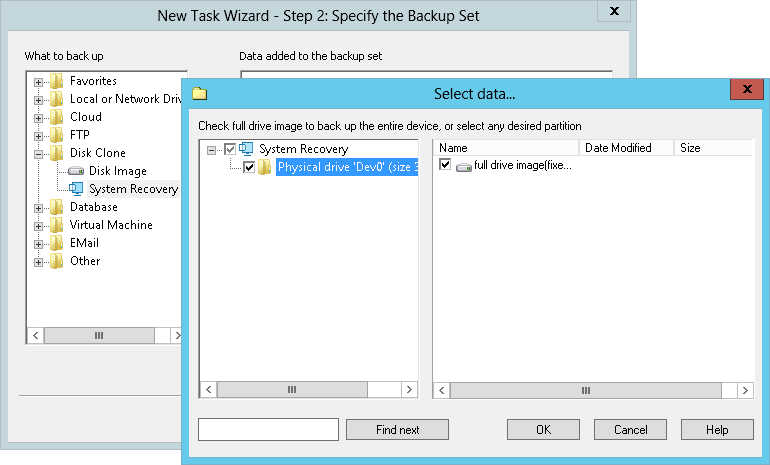 Select your system drive(s) to back up by marking checkboxes against drive name(s). Press “OK” and return to the data selection window. Proceed to the Step 3..
On this step, select a storage media for your system recovery disk image. Check if this media has enough size to contain this image. Create all other task parameters by setting up system recovery options step by step, as described in the User Manual. Note: You can schedule your task to execute for a time, or by plugging a USB device linked to this task to your computer. Finally, give your task a name. Now it will ready to work! The System Recovery software plug-in is a fast, flexible and effective tool allowing backing up full images of your operating system. Get an experience of using it by downloading a completely free trial edition of Handy Backup for a period of 30 days!